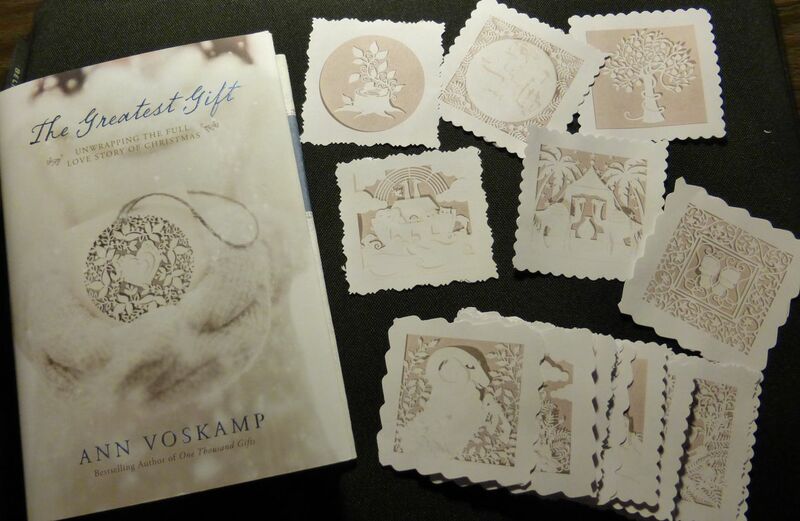 I’m excited to be going through Advent with Ann Voskamp’s beautiful book The Greatest Gift! It’s a Jesse Tree project where each day’s reading adds another bit to the story of Jesus’ family tree. There are 25 decorations too, one to go with each day’s reading (sorry, you have to buy the book to get the password). Very good price, Dawn (though Costco beat it by $1.00). It’s a beautiful book, isn’t it? I’m sure liking it so far. I had fun making the tree ornaments and trimming them with Mom’s fancy-edged Fiskars. I even eliminated all other ornaments but balls on our tiny tree, so these don’t have any competition. We’re all about everything handmade this year–or with at least a touch of handmade. It feels like there’s more heart in any handmade-something. Everything handmade? Wow! That’s ambitious. But I know I’ve certainly enjoyed the little bit of hand-making these tree ornaments took. What sorts of things are you making? Baked goods, knit things, stitched things, seasoning mixes that we blend (and our recipes to go with them). We don’t have tons of present-obligations, so it’s actually do-able. And fun. I’m looking into buying the book, but I’m guessing the ornaments only turned out beautiful because of the time, talent, and effort you put into them? Naw… They print up pretty light but I printed them double-sided as dark as I could get them, glued them together and cut with a fancy-edge scissors, then made a hole and threaded with gold cord. I have had this book for years and have even painted a ladder to go up my Christmas tree. I have been looking for the ornaments, however the ceramic ones would be too heavy. Where did you get your paper ornaments? Hi Cat, as I recall, there was a website that had the pattern for the printable paper decorations. The book had the website URL and password. I have since given my book away, so no longer have it for a reference, but I recall printing and cutting them out with downloaded files.